In a medium sized microwave-safe bowl combine sugar, softened butter, and water. Microwave on high for about 45 seconds or until butter is melted. Stir in 3/4 cup semi-sweet chocolate chips until melted. Stir in egg and vanilla extract, mix well. Add flour and baking soda, stir until combined. Allow the batter to cool to room temperature (doesn't take very long). Then, stir in 3/4 cup milk chocolate chips and remaining 1/4 cup of semi-sweet chocolate chips. Spoon batter evenly into Reynolds Staybrite muffin cups. Bake for 13-15 minutes or until top is set and a toothpick inserted into centre comes out slightly wet. After brownies are out of the oven, wait for centres to fall. This will happen upon cooling. If not then tap the centres with the back of a teaspoon to make a hole for the peanut butter. Place peanut butter in a small microwave-safe bowl. Microwave on high for 45 seconds then stir. 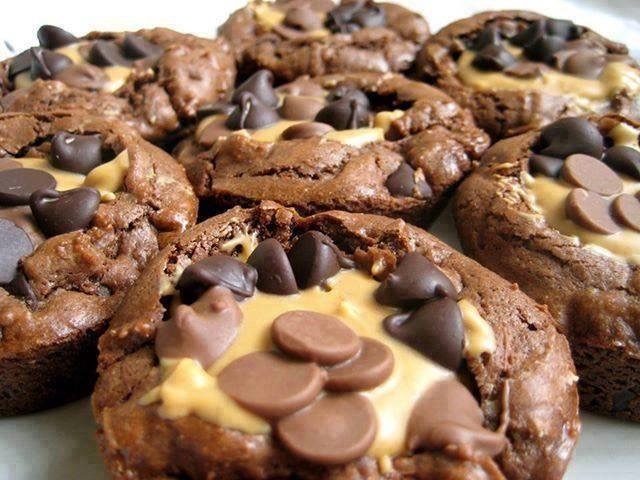 While brownies are still war spoon about a tablespoon full of peanut butter into the centre of each brownie. Top with remaining 1/3 cup of milk chocolate and semi-sweet chocolate chips. Cool completely in pan. Store at room temperature or in the refrigerator. To reheat the brownies just pop ‘em in the microwave for 10-15 seconds. Makes about 1 dozen brownies.